Guess what? It’s National Chocolate Week! 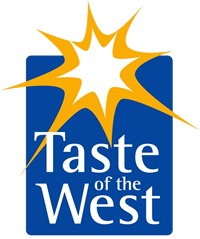 We thought we would celebrate by taking you on a chocolatey tour around some of the exhibitors you’ll be seeing in February. 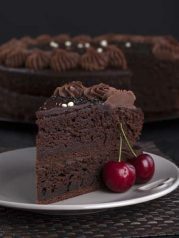 Let’s start with Truly Treats, and their Belgian Chocolate Cake. This is a chocoholics dream! A moist chocolate cake filled and topped with Belgian chocolate ganache, decorated with hand piped chocolate buttercream swirls and chocolate sprinkles. How does it stay so moist? That’ll be the yoghurt they use in the sponge. More importantly for retailers, it also has a good shelf life. If cake is not your thing, you could try their Cookie Dough Brownies! How about a liqueur from the Lyme Bay Winery to go with that? Maybe their award-winning Chocolate Orange Liqueur, which is a deliciously orangey chocolate treat. Serve over ice, or for a really indulgent treat, why not splash it over ice cream? 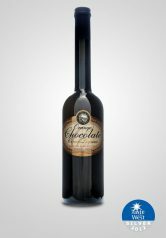 Then there’s their Double Chocolate Liqueur, which is a great treat for chocoholics any time of the year. The dark chocolate is perfectly complimented by the warmth of brandy and the smoothness of cream. Delicious! Devon Cottage Organic Fudge do a whole range of traditional, crumbly melt in the mouth fudge – and just happen to have one to match each of those liqueurs! All their ingredients are Organic and where available Fairtrade too. Why not treat yourself to a mouth-watering chocolate or chocolate orange fudge bar? 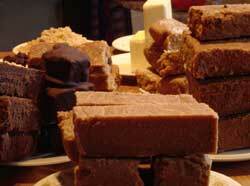 If biscuits get dipped in tea…can fudge be dipped in liqueur? If you fancy something lighter, then check out Baboo Gelato. Gelato is not simply the Italian name for ice cream. 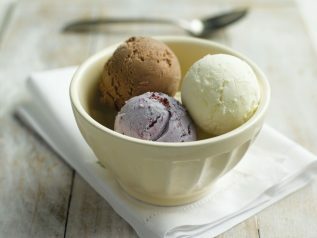 Although it feels very smooth, gelato is made using more milk than cream, and so is much lower in fat than traditional ice cream. There is also less air in gelato, which means it packs more flavour. Their rich dark Double Chocolate Gelato isn’t just chocolatey, it also has large chocolate chunks in it! 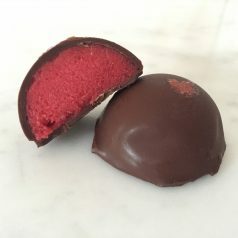 You could also try one of their Baboos – bite sized, multi-flavoured, dark Valhrona chocolate covered ice creams. How about the Slim Ewe Iced Desserts from Styles Farmhouse Ice Cream? All about great-tasting and healthier eating, these desserts retain all the natural taste, texture and health advantages of sheep’s milk whilst containing less than 2.5g of fat and under 75 calories per 100ml. And yes – it comes in Dark Chocolate amongst other flavours. All are suitable for vegetarians and none of them contain artificial colours. 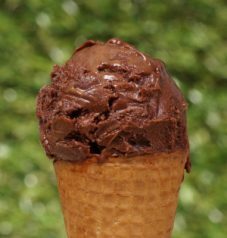 If you’d prefer something without any dairy in it all, then there’s the chocolate sorbet from Salcombe Dairy. Their biggest selling sorbet is their award-winning Mango…. but all their flavours are superb. 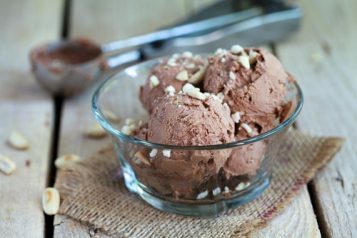 This decadent chocolate sorbet is a rich, velvety, indulgent sorbet that’s scrumptious on its own or as perfect accompaniment to raspberry tart. It’s perfect for anyone with or without a lactose intolerance! If traditional ice cream is more your kind of thing then the range of flavours from The Cowlick Creamery should suit you perfectly. White chocolate and raspberry, Chocolate brownie, Chilli chocolate, Peanut butter and chocolate chunks…the list goes on! They also specialise in alcohol infused ice creams and sorbets. Try the Dense Dark Chocolate Stout or the Chocolate Orange and Cointreau. It’s like having your dessert and digestif all in one! Maybe you’d prefer something a little less chilly? It is getting closer to winter after all. 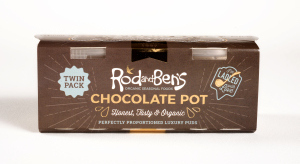 In that case Rod and Ben’s have a new range of perfectly proportioned luxury puds including a Chocolate Pot. If you love a pud of the rich chocolatey persuasion, then this fantabulous union of bitter dark chocolate and lovingly ladled double cream will delight your taste buds. 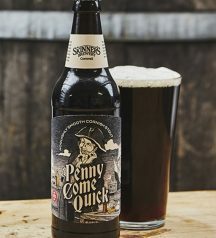 Finally, to wash all that down with, there’s the roguishly smooth Penny Come Quick milk stout from Skinner’s Brewery. It’s brewed seasonally using a fine combination of Cornish water; whole flower Northdown hops; Mount Hood hop; pale malt; crystal malt; and chocolate malt. This deep dark, smooth drinking Cornish milk stout is packed with deep flavours and your nose will pick up coffee and chocolate while your tongue will be treated to a bitter-sweetness with a touch of the florals. Perfect! If that little lot isn’t enough to tempt you to come to the show in February…well, why not tell us what we can do that will? And if it is, why not register now? « We’re going on a picnic!